Looking for a dog chew that's actually good for dogs? Our bully sticks are made of real, all-natural beef muscle to provide pups with all the necessary health benefits to grow big and strong. Low in fat, high in protein and extra delicious, these bully sticks help pups fight plaque and tartar buildup and keep them busy for hours on end. Q. Are your bully sticks really all natural? A. Yes! When we say the phrase "all natural," we really mean it. Our bully sticks are the real deal and free of any artificial ingredients, including hormones, preservatives, chemicals and any other strange additives you can think of. The only thing in 'em? The best tasting beef sourced from real cattle. Q. How do you make your bully sticks? A. Our bully sticks are sourced from the best cattle found on Earth. We take that all natural beef pizzle and slow roast it in the oven to bake in that juicy flavor pups love. Roasting also allows the bully stick to harden into that long lasting dog treat pups will have a blast chewing. Once they're roasted to perfection, your dog is ready to indulge in the best tasting bully stick ever! Q. How long do your bully sticks last? A. That depends on how much your dog likes to chew. Because they're made of all natural beef muscle, our bully sticks are some of the longest lasting dog chews around. We make 'em in varying lengths and thicknesses to cater to a wide variety of appetites and dog sizes. Our 9" Straight Bully Sticks in Medium are a great option for dogs of all sizes and all chewing abilities--try using 'em as fetch toys with your pup! If your pup simply can't go without bully sticks for long periods at a time, feel free to check out our Bulk Discount and Auto Delivery options. Combined, these two features allow you to easily stock up and save cash on your dog's favorite chews. And because they have such a long shelf life, our bully sticks are easy to stash away as special treats for your pup. A. It might seem too good to be true, but yes! 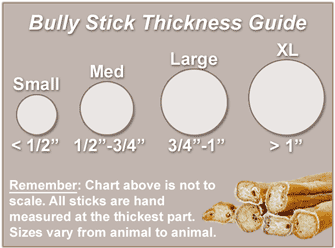 Our bully sticks are low-fat, high-protein treats that are beloved by all dogs. Because of their toughness, chewing on our bully sticks is a great way for your pup to clean off plaque and tartar. And as an added bonus, all that chewing is a natural way to relieve stress and anxiety, keeping your dog happy and busy for hours on end. 9" x 0.625" x 0.625"